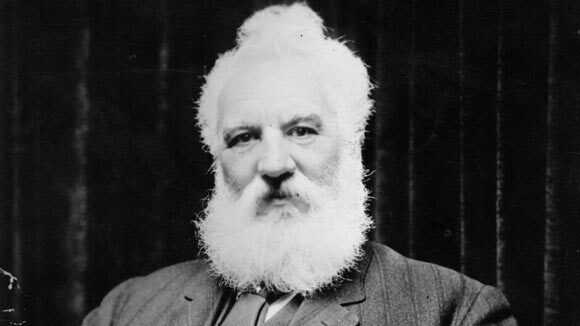 Alexander Graham Bell was a Scottish inventor who is most well known for inventing the world’s first practical telephone. Bell was born on March 3, 1847 to Alexander Melville Bell and Eliza Grace. Most of the Bell men including his father, grandfather and uncle were elocutionists and this is the field that Bell had intended to follow. He had an older brother and a younger brother, both of whom died at an early age due to tuberculosis. He was interested in acoustics from an early age, especially due to his mother’s gradually oncoming deafness. Bell received very little formal education and was mostly homeschooled by his mother. He was very close to and was largely influenced by her. Despite her deafness, Eliza was a proficient pianist and taught Bell to play the piano as well. Bell was a curious child and his first invention came at the age of 12. While playing at a grain mill with his friend, he noticed how painstakingly slow the process of husking was, so he invented a device with rotating paddles and nail brushes that could be used to de-husk the wheat much faster. He also showed ingenuity in other areas; he adapted a “finger tapping” method of communication so he could communicate the gist of the living room conversations to his mother. He also spoke close to her forehead so she could feel the vibrations of his voice. At the age of 15, he went to London to live with and care for his ageing grandfather and the two became very close. Alexander Bell Sr. instilled the love of learning further in his grandson. A year later, Bell accepted the position of elocution and music teacher at Weston House Academy in Scotland in return for lodging and being enrolled in Latin and Greek classes at a remuneration of £10 per session. Shortly afterwards though, the Bell family moved to Canada surrounding the deaths of his two brothers and Bell’s own failing health. In 1871, Bell started teaching at the Boston School for Deaf Mutes in place of his father. He taught there for one semester but grew fond of the intellectually stimulating environment of Boston. One of his deaf students was Mabel Hubbard whom he later married. At that time, Bell was researching into methods of transmitting several simultaneous telegraph transmissions on the same wire and this venture was financially backed by Mabel’s father Gardiner and Thomas Sanders, the father of one of his other students named George. It was during this project that Bell became interested in sending voice telegraphs. Gardiner was more interested in the earlier project but Bell persisted in his efforts. Alongside his skilled technician and assistant, Thomas Watson, Bell worked to perfect his idea. On March 10, 1876 Bell transmitted the first voice telegraph to Watson. He honed his idea further and made a number of public demonstrations at larger and larger distances. This phenomenon took the world by storm. In 1877, Bell established the Bell Telephone Company, the same year that he got married. Him and his wife travelled all over Europe making demonstrations. Bell was a remarkably successful inventor, but not a shrewd businessman. He faced more than 500 lawsuits regarding his telephone patents but none of them went against him and the company became more successful. In less than 10 years, more than 150,000 people in the United States alone owned telephones. Thomas Edison added a microphone to it which made it possible to hold a conversation at normal volumes rather than having to shout into the mouth piece. Alexander Graham Bell had a diverse range of interests and continued to innovate and invent. For this purpose he established the Volta laboratory in 1880. Some of his other innovation include the audiometer which was a device used to test for hearing impairment, along with other techniques to help deaf people hear. He also invented a rudimentary form of air conditioning system for his own house and was interested in renewable energy sources such as solar power, and production of methane gas from the waste produced by factories. He died in August 2, 1922 at the age of 75, followed shortly by his wife. The entire telephone system was shut down for one minute as a mark of respect for his remarkable life and achievements.